Careful With That Axe, Eugene: Eircom fights back! My recent moans about Eircom finally got results. After some recent contacts by Eircom staff, my Broadband speed has almost trebled - look at the latest speed test result! Recently the best I could get was 1.79 Mbps download - before this about 1Mbps was average. 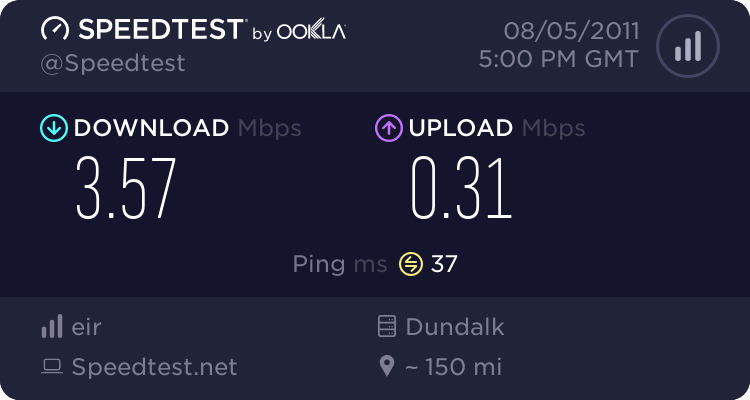 3.57 Mbps is still "slower that 71% of" Ireland and Speedtest.net rates this as a grade "D" - however, this is enough to keep me happy. Richard, Eircom's excellent engineer who came to my house today, fixed the connection so that it is set to 4 Mbps at point of entry to the house. I am to expect some loss of signal within the house. 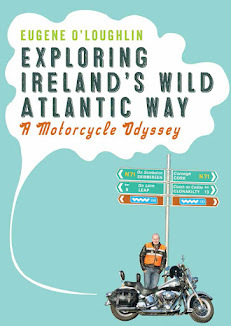 He also told me that the distance from my local exchange is effectively doubled because the phone line goes up one side of the road (Newtownpark Avenue) and down the other before it gets to my house - adding about 1.5km to the distance. I also received a call yesterday from another Eircom engineer who told me that my line had actually been capped at 2 Mbps - no wonder I couldn't get higher. He increased it there and then and suddenly the speed shot up to 2.5 Mbps - Eircom Richard tops this off today. So - credit where it is due. Thank you to Eircom for dramatically improving the connection. You have not lost a customer! Thanks to Twitter and Blogger for helping me communicate my issues - the power of social media shows itself again.